The Sami people, also spelled as Saami are an ethnic group of people living in Sápmi, an area in the far north of Europe. It is a part of Norway, Sweden, Finland and Russia. The number of Sami people in the world is between 80,000 and 135,000. The Sami are sometimes called Lapps, but this is insulting and has a negative meaning. In English the area is sometimes still called Lapland. There are 10 different spoken Sami languages. Six of these can be written. The first written mention of the Sami", was made about 98 A.D. by Tacitus . One account (or description) from 896 was told to Alfred the Great, by Ohthere of Hålogaland (a Norwegian chieftain). Ohthere had some connection to the English king's court. In the 19th century, Russia stopped allowing reindeer farmers and their reindeer herds, to come travel over the Norway-Russia border. Some of the Sami reindeer farmers, moved to another Nordic country, and took their reindeer herds into Russia (but not through the Norway-Russia border); later another country's border with Russia, was closed to herds from reindeer farming (coming into Russia). During the 16th century there was growth in farming settlements in Finland. Farmers from the province of Savonia settled the vast wilderness regions in Middle Finland, and the original Sami population often had to leave. At Dovrefjell when Harald Hardrada was king, there was profit from the keeping of herds of reindeer, and the business was at its highest  intensity. In regard to Sami (in Norway) that had reindeer herds; when these Sami moved their herds (every year), then they would interact with people who lived permanently on the coast; the interaction also included verdde: a friendship of convenience; for example, Sami needed milk and fish after having been on a plateau (or highland) for some weeks; Sami might need repair of equipment; trade was done: People from the coast traded fish for meat from reindeer. Regarding getting the Sami to change their religion to Christianity: In the 18th century Thomas von Westen (no), a pietist, led missionary work (among the Sami), that has been called a concerted (or special) effort. "About a century later, Niels Vibe Stockfleth (no) worked among the Sami and translated [the Bible's] New Testament into" [one of the Sami languages]. People living permanently on the coast in North Norway, were [largely] Sami; these Sami had permanent housing, and it became easier for these Sami to stop behaving like Sami; in some areas one was not allowed to own land, if one was Sami; some Sami changed names, to names that might sound more Norwegian (and family names such as Sæter, Strømeng, and Kalvemo became new family names). Sami language [largely] disappeared among the Coastal Sami. Sami that did reindeer farming, and Coastal Sami slowly lost the close contact [between the two groups]. "There were organized attempts to eradicate [or make to disappear ] the Sami language and culture[,] as a step in assimilating the Sami into Norwegian society". Policies to "Norwegianize", Samis - were in place from the late 1840s, into the 1980s. "The authorities also" used "economic measures to carry out the work of Norwegianization, including the Land Act. A regulation [or part of the law] from 1902" says that "Sale [of land] may only be made to Norwegian citizens ... who can speak, read, and write the Norwegian language and use it on a day-to-day basis". A report by the "Parliamentary School Commission, appointed in 1922" said, without being able to show [ evidence], "that that the Sami are less educable [or able to learn] than others"; the report also said that the Sami population is less gifted and the "Sami culture does not lend itself to development". From around 1850, a government policy of Fornorskning [tried to remove Sami culture]. An article in Klassekampen said that the policy was very rough [to Sami persons]. Into the 1980s, the policy of Fornorskning lasted in some places. [Possibly the first] Sami association (in Norway) was started during the New Year's weekend in 1911: Buolbmag Same Særvve, in Polmak municipality. The first Sami association in Sweden, seems to have been started in 1903: Tärnaby lappeforening. In 1826, Russia has not allowed reindeer herds and their Sami owners, to travel from Norway to Russia. Since 1852, Russia has not allowed reindeer herds and their Sami owners, to travel from Norway to Russia. Reindeer farming, which is a type of animal husbandry, is done by Sami, between the White Sea and towards the west and the south, across Russia's Kola peninsula, Finland, Sweden and Norway, into Norway's county of Hedmark. Among the Sami people are nomads that do reindeer farming. They lived in their cold environment by domesticating the reindeer. They were able to get everything they needed from the deer. They ate mostly meat, milk, and cheese. Their clothing was made from reindeer skins and wool. Their tents were also made from raindeer skins. The wool clothes were beautifully decorated. The Sami protected the herds, moving with them as they migrated from summer to winter pastures. They used reindeer to pull sleds carrying their supplies. During the winter, the herds moved south of where the trees grew. The Sami lived nearby in homes made of logs or sod. Winter clothing was made from layers of reindeer skin. The inside layer would be worn with the fur facing in toward the person's skin. The second layer was worn with the fur facing out. Boots were also made of fur and lined with grass that had been gathered during the short summer. Every evening the grass would be taken out and dried by the fire, so it would be ready to use again the next day. This way, a Sami could be warm and comfortable in even the coldest weather. Today only a few of the Sami people still follow the herds. Those few use modern tools on their ancient migration. They use snowmobiles to herd the reindeer and rifles to kill the wolves that chase them. Even helicopters and radios are used to locate and move the reindeer. Most of the Sami now live on small farms in one of the four nations of Lapland. They raise crops and animals, including a few reindeer, to meet their needs. The sale of reindeer meat is an important source of income for the Sami people. The Sami did not waste anything they got from the reindeer. The milk was used to drink or make cheese. Meat was taken for food. The blood was frozen and later used for soup and pancakes. Knives and belt buckles were carved from the bones and antlers. The sinews (tendons) were used as sewing thread. Cleaned-out stomachs were used to carry milk or cheese. Every part of a dead reindeer was used. Sami crafts are called duodji (en:). The men make knives, drums and 'guksi' (burl cups) from wood, bone, and antlers. The women use leather and roots to make 'gakti' (clothing). Women also use birch and spruce to weave baskets. Sami clothing is called 'gakti' and was originally made from reindeer leather, but now it is usually made from wool, cotton, or silk. Usually, there are different types of clothing for men and women. Sami shamanism is the main religion of the Sami people. These beliefs are connected to the land, animalism, and the supernatural. There is some practice of bear worship. It is a polytheistic religion with many gods. 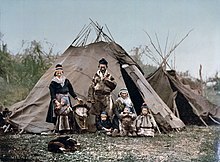 The Sami shaman are called the 'Noadi'. There are some 'wise men' and 'wise women' who try to heal people who are sick. They use rituals and herbal medicine. Some Sami people have changed their beliefs to Christianity and joined either the Russian Orthodox Church or the Lutheran. Publications by Snorri Sturluson(1178-1241) say that a Sami woman, Snøfrid, married Harald Fairhair; furthermore, none of her children or grandchildren became kings; first when Harald Hardrada became a king, then her blood became part of the blood of the royal family. ↑ "Sami". Minority Rights Group. ↑ Odd Mathis Hætta. "The Sami - Before and Now". March 2002; number 2. The Norseman. p. 5"... Tacitus ... in his De origine et situ Germanorum ... Hætta is assistant professor at the University College in Finnmark"
↑ Steinsland, Gro (2017-07-27). "Stammor Snøfrid". Klassekampen. p. 21. ↑ 5.0 5.1 5.2 5.3 5.4 Ole Magnus Rapp (2017-07-27). "Konfliktløsning via vennskapelig fotball. Nyttevennskap". Klassekampen. p. 9. ↑ 7.0 7.1 7.2 Larsson, Carl-Gøran (24 June 2017). "«Vakre er de ikke»". NRK.